Watching Amy Sherald step onstage at Spelman College, her pink-framed glasses screaming fun and her blonde afro perfectly coiffed, it’s hard to believe that there were times in her life when she almost wasn’t an artist. As a freshman at Clark Atlanta University, she was pre-med and later a heart condition nearly dulled her wash. However, as she settled into a high-back chair, smoothing out her multi-colored striped dress and crossing her legs to reveal a pair of crisp white and rose gold sneakers, it was clear that a master was in the room. With an auditorium full of art students and fans hanging onto her every word, she seemed right at home. Sherald was born in Columbus, Georgia in 1973 when as she describes it “there was still residual racism.” Her father was a dentist, and her mother was an educator, and they intended for their children to become doctors, lawyers accountants—anything but an artist. So, when she moved to Atlanta and started her freshman year at Clark, she was ready to follow the charted path. But, an encounter with a street artist in downtown Atlanta changed everything. She told the man that she was an artist and showed him one of her drawings. He told her that if she didn’t use her talent, she would lose it, and that was all the impetus she needed to start taking art classes at Spelman. She found her niche in figurative painting, a genre that called to her because of the absence of black faces. Romanticized images of white aristocrats dominate most museums' portrait collection, and Sherald has made it her mission to expand the art historical narrative by painting black people from all walks of life. 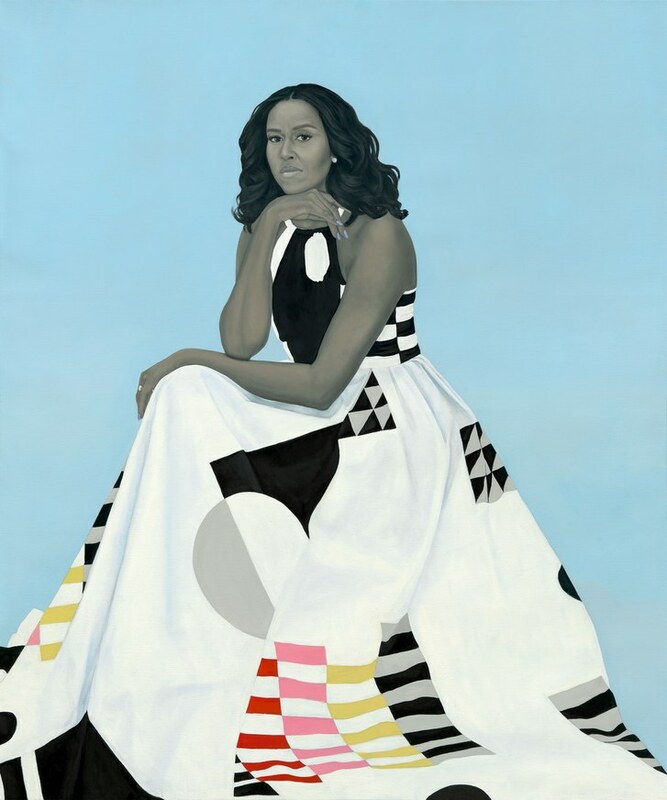 Most notably, she was selected to paint Michelle Obama for the National Portrait Gallery, and her representation of the former first lady drew a range of ridicule and praise. Those unfamiliar with her signature use of gray to represent black and brown skin were puzzled by the choice, but those familiar with her genius knew she was right on point. Sherald’s paintings have become famous for their large size, impeccably detailed garments, and saturated pastel-colored backgrounds. Those colors were born out of the architecture of Panama, which is where she participated in an artist residency as an undergraduate. Her models don’t have to be famous to be valuable, and their essence is not appeasing in the context of surviving in white supremacist culture. She usually finds them out in the world and spends about an hour with them before getting to work. Twenty years later, Spelman Museum of Fine Art is the final venue for her self-titled solo exhibition, which started at the Contemporary Art Museum St. Louis last year. Sherald has created about 50 portraits in her career, and the Spelman exhibition features nine of them, on display through May 16. The museum included some of her work in their “Africa Forecast” exhibition two years ago, but this is the first solo exhibition. Today, Sherald’s work is in the permanent collections at the Nasher Museum of Art in Raleigh, North Carolina, and the Smithsonian Museum of African American History & Culture in Washington. 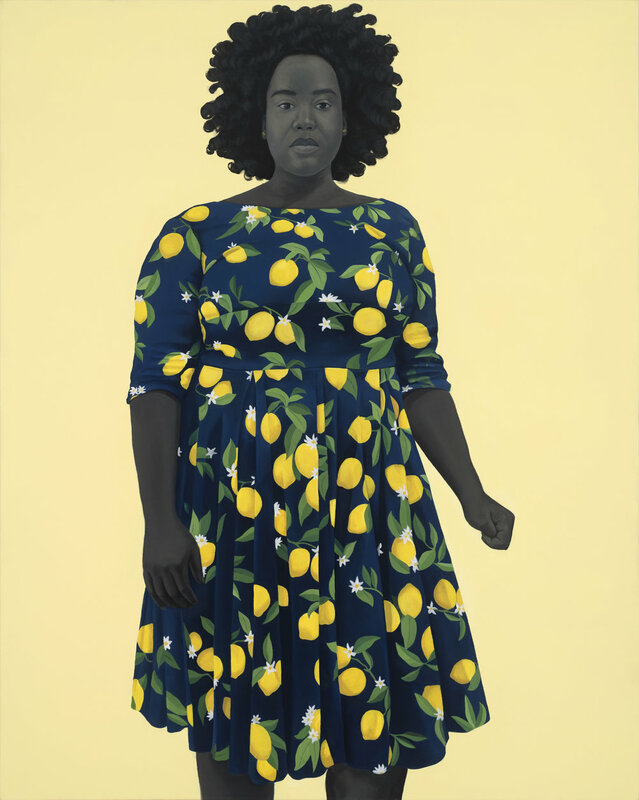 She is also a past winner of the David C. Driskell Prize from the High Museum in Atlanta, and in 2014 she was the first woman to win the Smithsonian National Portrait Gallery’s Outwin Boochever Portrait Competition. She lives in Baltimore, a city she says she loves because of its diversity, history, architecture, and absence of pretense. (She earned her MFA from the Maryland Institute College of Art in 2004.) I spoke to Sherald about growing up in the South and her career thus far. Kelundra: How would you describe the South in three words? Amy: Where I am from in Columbus … my description would be different if I lived in Atlanta and was as black as it was. I guess I’ll say a place of hospitality, great food, and lots of family, very family-oriented. Kelundra: What comes to mind for you when you think of home? Amy: I had a great childhood growing up in Columbus. Because I was born in 1973, there was still a lot of residual racism, and so I feel mixed about it. I have the warm and fuzzies, and then there’s segregation. Kelundra: When did you first get into art? Amy: I was always really into it as a kid, but I didn’t get serious about it until high school. It’s what I was compelled to do. I’m inspired by movies, photographs, people, my environment in general. People watching and making money. That’s everybody’s aspiration at some point. Kelundra: Where do the names of your paintings come from? Amy: My sister names a lot of them because she’s the writer in the family, even though her career is in law. When she doesn’t name them, I usually thumb through poetry books and find words or partial sentences that formulate the idea that I feel behind the poem. I’ll Google Toni Morrison quotes, or Alice Walker, Lucille Clifton—any black female writer that I can think of and I start reading their works. Kelundra: Do you have a favorite book by one of those women? Amy: Beloved is one of my favorite books and one of my favorite movies. Kelundra: A lot of your paintings depict black women, but their skin is not the brown we expect. They often look charcoal, slate or gray. Why did you decide to do that? Amy: Well, I’m an artist first, so all of my decisions are aesthetic. I did it because I thought it looked beautiful and helped the colors pop in the paintings. Looking back, it was also about exploring race as a social construct without being didactic. Kelundra: Are all of the models people you know? Amy: They’re all models that I find, and a couple of them are my friends. Kelundra: Have you painted yourself? Amy: I did all through graduate school, but not since I discovered my artistic style. Kelundra: You’ve mentioned your mom and sister. Have you painted them? Amy: I think my mom would be the only person I would paint. The people in my images are people I am drawn to by intuition. Kelundra: I want to take a turn here for a moment and talk about fashion. The people are gray, but the garments are always vibrant. Is fashion an influence for you? Who are some of your favorite designers? Amy: I admire a lot of designers. One of my favorites that I haven’t been able to meet or wear is Azede Jean-Pierre. She’s Haitian American, and she lives in New York. A lot of her designs are like paintings. Her patterns, structure, and lines are really beautiful. She works in black & white sometimes and sometimes there’s a lot of color. It’s very sculptural. Kelundra: When you’re talking about approaching conversations about race, where does that intersect with fashion in your paintings. Amy: Their presence alone is what’s speaking as opposed to a direct conversation. Painting black bodies is political. If race wasn’t still such a huge issue, and it always will be, then figurative paintings of black people in museums wouldn’t be such a big deal. Historically, we have been underrepresented, and figurative painting sits in an art historical narrative in a different way than abstraction does. It speaks to the void of black figures in representational work in the art historical narrative. Kelundra: I want to speak to that narrative. You did a painting years ago that was displayed at Spelman that looks like a black rag doll, [“Freeing herself was one thing, taking ownership of that freed self was another”]. Amy: I was at Artscape in Baltimore, and she was walking around in that outfit. I had been wanting to paint someone who was in a subculture that was black, and around that time we were starting to see black kids on skateboards. I remember when I was her age, 22, and I was taking classes at Spelman, I kind of dressed like that. I shaved my head, wore all black and had military boots on all the time. I was a part of another way of being black. She was a necessary part of the narrative of us not being a monolith. Kelundra: Are there any new pieces that are exclusive to Spelman? Amy: “Mama has made the bread” I found that dress and that fur shawl. I had that outfit for a few months before I found the model. Kelundra: What heart or head space do you want people to be in when they experience your work? Amy: If you’re black, I want it to be a resting place to see a reflection of yourself in a way that is perhaps opposite of what you would see in the media. I want it to be reflective of beauty, dignity, and self-worth. For people who are not black, I want them to take the time to internalize something that’s not them. With race relations in America, blackness hasn’t been treated like any other ethnicity. For example, if a children’s book has a black character, white parents are less likely to buy it for their child. People look at blackness as something that they can’t bring into their own humanity. Kelundra: Let’s talk about painting Michelle Obama. How did the ask come to you? Amy: The Smithsonian National Portrait Gallery started commissioning First Lady portraits with Hillary Clinton. Toward the end of the administration, they sent a portfolio of 20 or more artists, and the Obamas short-listed five. I don’t know who the other five were, but we all met with them at the White House, and they chose me. 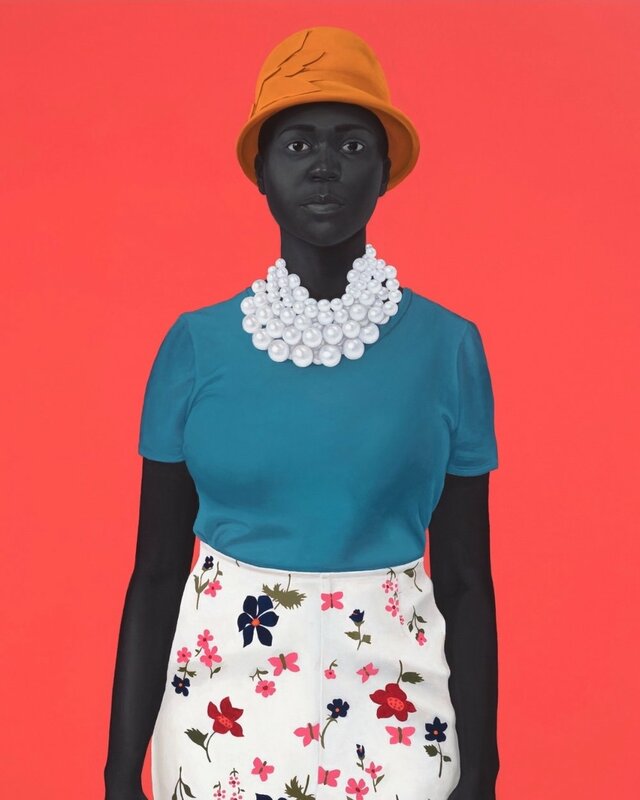 Kelundra: I traveled to the National Portrait Gallery and saw the portrait. I thought it was beautiful. I especially liked the dress; what made you pick that dress? Amy: We looked at 11 dresses and narrowed it down to two because that one spoke to me the most because there were other narratives within it that I felt were important to ground her within the history of black culture. The shapes reminded me of the geometric patterns in the Gee’s Bend quilts. Kelundra: Talk to me about what’s next for you. Amy: I’m working toward my solo at Hauser & Wirth in New York City. That is going to take up every day of my life until the opening.